Here's perhaps the most perverted and misguided comment in the entire debate over "Merry Christmas" or "Happy Holidays." 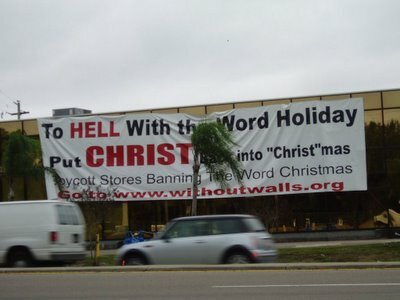 A church in Florida (Without Walls International Church) has declared, "To Hell with the word Holiday; put Christ back into Christmas! The saying is found on the church's homepage, which then takes you to a link to support boycotts of stores saying "Happy Holidays." Additionally, here is a banner the church put up with the message and guiding people to their church's website. Is this why Jesus came to earth?! So we can cuss at people and boycotts stores. Maybe if this church spent this time and money trying to tell people about the love of Jesus then everyone would celebrate the real meaning of Christmas (I think Jesus would actually boycott an unloving and misguided church such as this—as well as other “white-washed tombs”). Thanks to the Dark Christianity blog for catching this one.